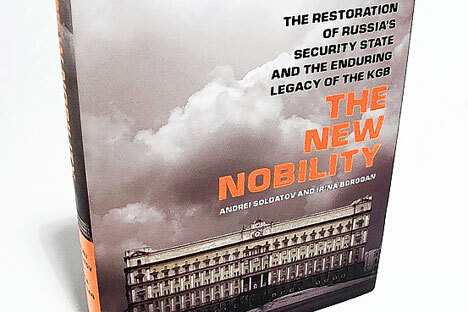 The New Nobility, by Andrei Soldatov and Irina Borogan, may not contain any earth-shattering information, but provides a comprehensive overview of one of Russia's most dominant institutions. Ten years later, in 2010, two Russian journalists, Andrei Soldatov and Irina Borogan, offer readers a comprehensive summary of the known life of this secretive organization with their book The New Nobility: The restoration of Russia’s Security State and the Enduring Legacy of the KGB. “We view our work as a part of the dialogue between those in power and ordinary Russian citizens concerned about their political freedoms and the way Russia is perceived domestically and abroad,” Andrei Soldatov said in a recent interview. Indeed, the book is nothing less then an attempt to paint a comprehensive picture of Russia’s security services and their evolution over the course of the last decade. Based primarily on the investigative work of a dozen Russian newspapers, the book is written by journalists living and working in Russia. As it turned out, the story of mutual distrust between the Soviet security services and the ruling Communist party was particularly bloody. In little more then 70 years, the security apparatus survived nine reorganizations, with six out of nine heads of services executed for high treason. However, the KGB-free period, known as “the interregnum,” was not to last. In April 1995, as a part of the preparation for his presidential campaign, Yeltsin effectively recreated an all too familiar conglomerate of security organizations with extensive powers to conduct intelligence activities not only abroad, but also in Russia. Yeltsin surprisingly survived a KGB-instigated coup d’etat in August of 1991. Putin’s December 1999 appointment as a successor-designate was quite a turn from that moment. By the early 2000s, Russia had returned to the era of no public supervision, no judicial control and no independent media. The FSB took on monumental importance and ambition. By the mid 2000s, almost all top political figures were people with a KGB past, with both houses of parliament headed by the people closely associated with the state security apparatus. Undercover FSB officers operate in all spheres of society, according to Soldatov and Borogan. They gather foreign intelligence and obtain counterintelligence, guard national borders, protect the country’s leadership, silence dissent and closely monitor all aspects of social, cultural and religious life. They are directly involved in management of the country’s biggest and most powerful industrial and financial enterprises—the security services now are as omnipresent and omnipotent, as they were in the early 1950’s. Yet most of this information is already well documented, and known to the average Russia watcher; The New Nobility does not deliver on that revelatory moment. There are no new nuggets of secret information. As the authors readily admit, the book is based on texts published over the past decade. Instead of uncovering some hidden agenda on turning the world into Russia’s backyard or combating American imperialism, the book paints a picture in soft, if only slightly dull, colors: It evokes a portrait of amateurish, evergreen idealists, attempting to save Russia from the destructive influences of the West, seasoned professionals making one blunder after another, and of narrow-minded operatives only too slow to react to the ever changing world, of greedy opportunists, willing to swap sides as often as it pays. These FSB officers are capable of nothing more then a smart career move to an oil firm’s board of directors or an international cultural foundation. How accurate is this picture? After all, what is the picture of the FSB that best suits the reader? Incompetent enough to make you sleep well, or evil enough to keep the CIA budget growing? The FSB is certainly interesting enough to keep writing about and entertaining enough to go on reading. For the English-speaking reader, The New Nobility is the most exhaustive exploration of its kind.